Digitization of herbarium specimens—capturing images and label data in digital formats—remains an enormous task for the world’s herbaria. 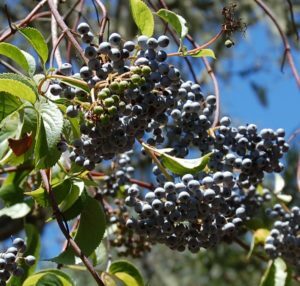 For 22 institutions in the U.S. state of California, this job has become easier with a new 4-year, $1.8 million National Science Foundation grant (Award # 1802301) to establish a new California Phenology Thematic Collections Network (TCN). Spearheaded by Dr. Jenn Yost, Director the Hoover Herbarium at the California Polytechnic State University, this new network aims to image over 900,000 herbarium specimens from the oldest records, the most diverse families, and most threatened families in California. California is a biodiversity hotspot and home to more than one third of all U.S. plant species, emphasizing the need to understand this diverse and changing flora through herbarium records. The region’s herbaria already have a strong history of collaboration in the Consortium of California Herbaria, and this project aims to strengthen and expand the capabilities of this community of universities, research stations, natural history museums, and botanical gardens. The project is trailblazing not only in its ambitious digitization goals and cast of collaborating institutions, but also in its research aim: to better understand flowering time shifts by recording flowering (i.e., phenological) data for each specimen digitized over the course of the grant. Flowering time is an important biological phenomenon for science, society, and biodiversity, and herbarium specimens can provide rich data on how flowering times vary across time and space. This project builds upon recent advancements in standardization and sharing of phenological data, including the Plant Phenology Ontology and data standards developed in collaboration with the New England Vascular Plants TCN, to capture phenological data. Furthermore, the project will digitize specimens of 250 taxa currently monitored by the California Phenology Project and National Phenology Network, empowering future cross-comparisons of specimen-based and observational phenological data. The institutions involved in this project will explore several workflows for capturing phenological data: from specimen sheets during imaging, from label text using a new Attribute Mining tool, and from images using crowd-sourced Notes from Nature expeditions that engage a broad audience of citizen scientists, students, and volunteers to produce phenological scorings. 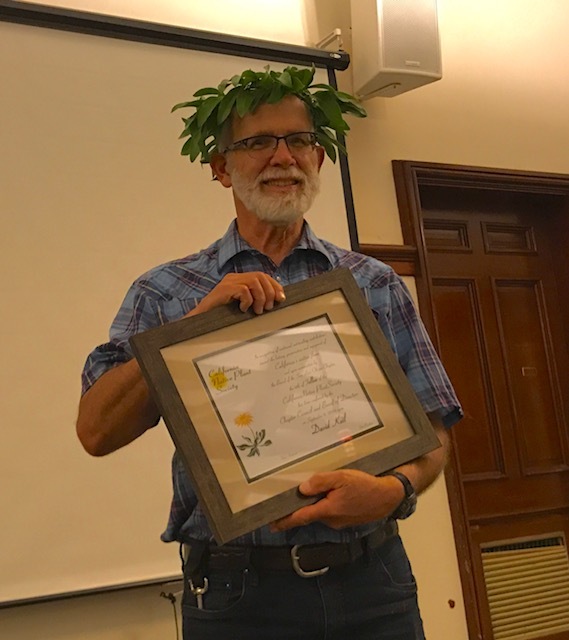 With the efforts of this community of California herbaria, the project hopes to build a strong foundation for the future of capturing phenological data from herbarium specimens. All specimen images and records produced in this project will be publicly available for research, education, and outreach via the CCH2 portal, an open-source, web-accessible database platform widely used by other collections and TCNs. The project will also develop new tools in CCH2 to mine, explore, and store phenological data, and all data will be aggregated and available through the iDigBio portal. For Cal Poly, this means a lot of great changes. We have hired Katie Pearson as the Project Manager and she is now based here in San Luis Obispo. We have purchased an imaging station to image 40,000 specimens over the next few years. Annie Ayers, a Cal Poly undergraduate and CNPS board member, has been hired as a curatorial assistant. Our workflows are changing and pretty soon, you’ll be able to look at our specimens from the comfort of home! The project runs from 2018 – 2022. Jason Alexander from UC Berkeley is the Data Manager and Katie Pearson is the Program Manager. The tools, techniques, and data generated as part of this project will expand the value of herbarium specimens in addressing society’s problems. More information can be found at http://www.capturingcaliforniasflowers.org or by emailing jyost@calpoly.edu. This project is funded by the Advancing Digitization of Biological Collections program of the National Science Foundation. Many California herbaria are contributing to this Thematic Collections Network. Collection, which will contain one representative specimen for each species in the county. Volunteers look through our specimens and pick the one that should be added to the Voucher Collection. Additionally, we are actively working on our moss and lichen collections. Volunteers can choose what aspects of the work they would like to participate in. Any and everyone is welcome. The Hoover Herbarium is located on the 3rd floor of the Fisher Science Building (33) in rooms 352 and 359. Starting Sept 18th, the herbarium volunteers sessions will be Mondays from 3-5 pm and Fridays 9 – 11 and 1 – 3 pm. 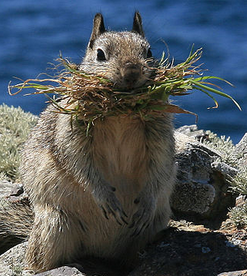 California ground squirrel aka Beechey ground squirrel (Otospermophilus beecheyi), may look cute or even cuddly, but ground squirrels could be the worst things to hit your garden since your cousin came to visit in his RV. No, seriously, this last year saw an explosion of the squirrel population due to the late but heavy March rains which brought a profusion of good things to feed the ground squirrels. And multiply they indeed did. First, don’t use poison to control squirrels. The possibility of poisoning another species unintentionally, such as an owl, a hawk, or a turkey vulture is too problematic. Instead, I opt to capture the squirrel in a live trap then remove them to the wild, or to Pacific Wildlife Care to feed their rehab birds. Selecting a live trap can be complicated. I prefer the larger live trap to capture the critter. I use a combination of peanut butter and birdseed to bait the trap, placing it on the trap trigger. Once I catch the squirrel, I cover the trap with a towel so as to calm the little guy down until I can release him in another suitable place, which is up to you. Next month we will cover gopher control. Until then, Happy Gardening. 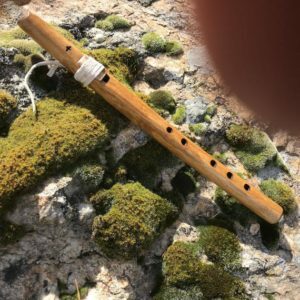 I’m introducing a new artist with this cover of the Obispoensis. The artist is Heather Johnson, who paints beautiful renditions of California native plants, so I asked her if she would allow them to be displayed on the Obispoensis cover. Thankfully, she agreed and has sent me several. I was really taken by the first one I looked at! It was of a leafy twig of the California grape in fall color. California grapes are widespread through Northern California where they favor, but are not restricted to, stream sides. However, I was surprised by Heather showing them having bright red color. If you are seeing the cover in black and white, I recommend that you go to cnpsslo.org and see them in their brilliant red color. The leaf color rendition produced by Heather closely matches the color of the leaves I saw in photos on the Web. There is a problem with the leaf color however, and trying to resolve it lead me to a very interesting story. This is because the usual fall color of California grape leaves is pale yellow not red. So where did the red come from. It turns out that the entire story of its finding and selection is well known and is worth a google search. In late October 1983, Roger Raiche of the U.C. Berkeley Botanic Garden, first saw a California grape with bright red leaves growing alongside Palmer Creek Road in rural Sonoma County, west of Healdsburg, California. He collected cuttings, rooted them in the green house and finally planted them out in the botanic garden. They grew easily and with minimal care and little water. 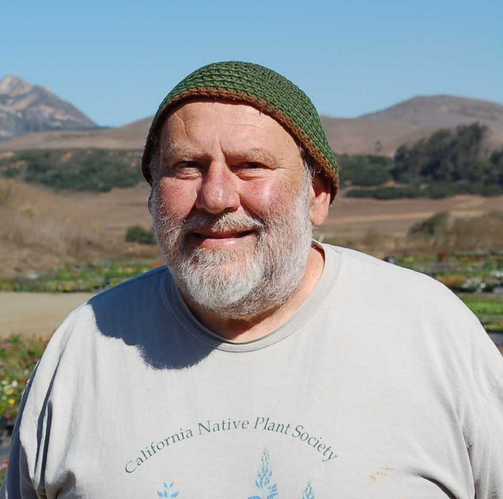 Later he gave cuttings to a garden volunteer who was also a member of the local California Native Plant Society Chapter. She donated a flat of them to her CNPS Chapter’s plant sale. She labeled the flat simply “Roger’s red grape.” When those plants were sold, the name was born, although the cultivar ‘Roger’s Red’ has never been registered or patented. So far we find we have a cultivar with very unique fall color that was found growing wild. But, we still haven’t discovered the origin or the red color. It turns out careful observation of the cultivar ‘Rogers Red’ indicated that it’s not pure Vitis californica and that it shared characteristics with the European wine grape (Vitis vinifera). Further observations limited the possible ancestor to a particular variety of commercial vine grape commonly grown for its reddish fruits. The red fruits of this variety were used to add extra color to red wines. This variety was and still is Vitis vinifera ‘Alicante Bouschet’ and has been grown in California for years. 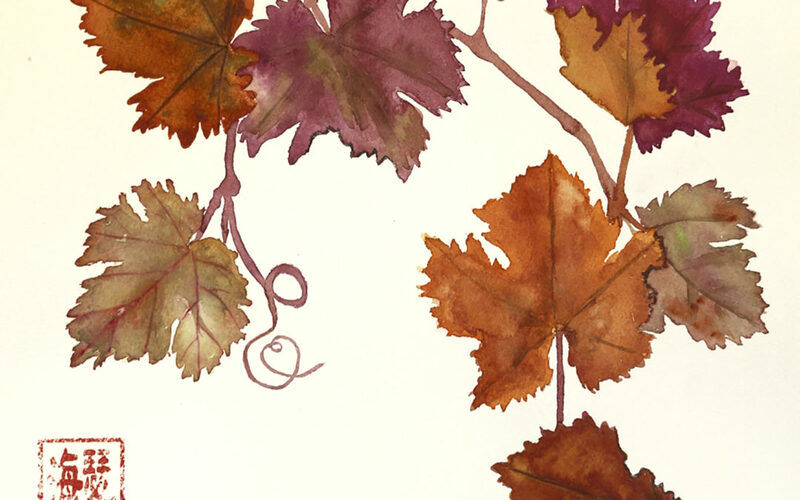 As well as reddish fruits, this variety of wine grape produces bright red leaves in the fall. Enter DNA to the story. Several DNA studies proved that the cultivar ‘Roger’s Red’ is truly a hybrid between the native California grape and the European wine grape Vitis vinifera var. Alicante Bouschet. This California native (hybrid) is extremely popular and is widely available at nurseries and probably CNPS native plant sales around the state. It’s easy to grow and tolerates many different soils, watering regimes and different levels of shade. Its major fault might be its rapid, aggressive growth. It will require taming. Its fruits are edible, but the seeds are large and the flesh is thin. Not a great ‘eat-off-the vine’ fruit but they can be turned into a nice drink. Conicosia is in the Aizoaceae family. It is a succulent perennial with a crowded basal rosette of smooth, bright green, upright, linear leaves. Clustered with the leaves are stems with brilliant yellow flowers. All this on top of a carrot like root. It’s capsule fruits are dry at maturity. Conicosia is abundant on coastal dunes. It seems like nearly anywhere I travel in the back dunes from Oceano to Guadalupe—there they are—they’re so darn ubiquitous! 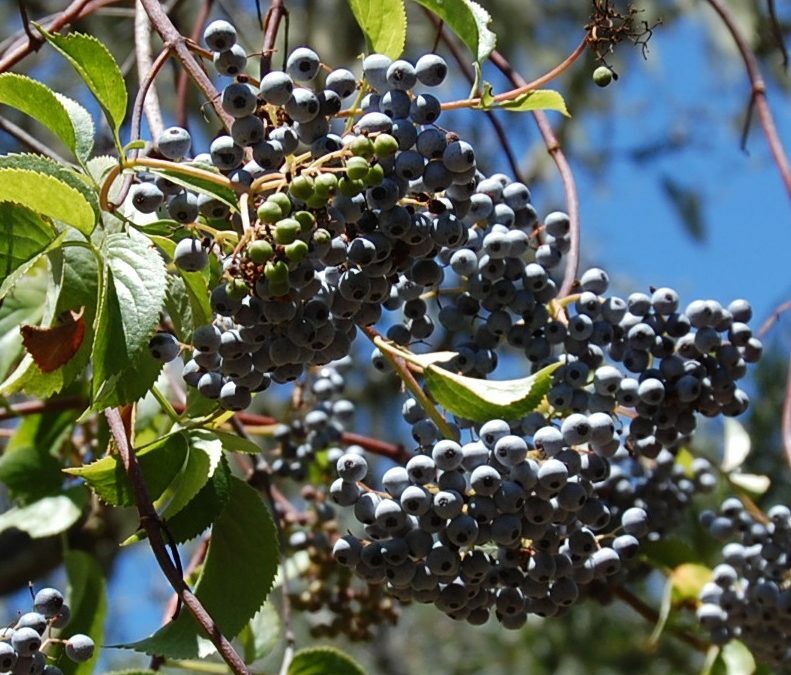 Conicosia crowds out native plants and is a prolific seed producer. This month’s President’s notes will be divided into two parts, with the second part included in the November issue. As someone who frequently hikes in our California landscape, I often ponder over the abundance and diversity of exotic species that have naturalized here, and how that came to pass, specifically during the past two centuries. This is not to say humans did not move plants around California prior to the arrival of Europeans, but historical records point to the introduction and, in some cases, rapid dispersal of non-native species in our state, as a post-European-arrival event. So, I set out to satisfy my curiosity, and in the process found some interesting facts. How did so many non-native species find their way to California and how could they spread so quickly and in such large populations – was it intentional or by accident – by air, by water, by animal, by human, etc.? I reckon humans have had preferences for certain plant species since the beginning of time, thus altering the landscape to create a more desirable food supply. As North Americans, most of the plant species we consume are actually native to somewhere else, where simple domestication events started eons ago. 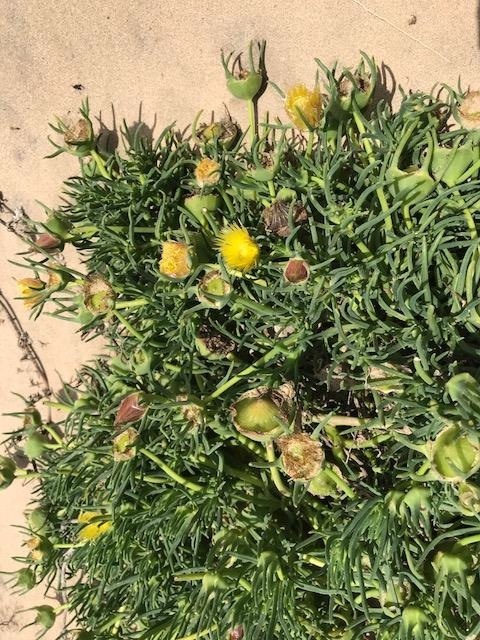 However, as non-native plant species were carried to other continents during the last 500 years, adequate safeguards for their containment were apparently not well understood, and the botanical invasion we see today in California correctly had its origins in the not so distant past. Here’s one example. I am astonished to see European fennel (Foeniculum vulgare) growing in such numbers in abandoned fields in my neighborhood. It is particularly thick along the railway right-of-way that bisects this vicinity. How did those plants get so well established here? One possible scenario could be – it’s originally from Greece, then traveled to Italy, then to Spain, to Mexico, and finally to California, where it was planted in the early gardens in this area, and then transported via the hooves of horses and on the wagons they pulled, later on the trains, trucks and tractors that worked and subdivided the land, and finally via the shoes, socks, and pockets of humans. I wonder if that is how it really occurred. 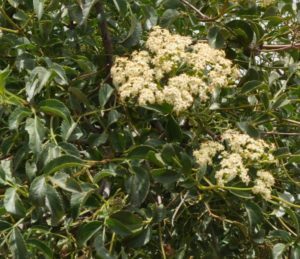 This hypothesis comes from observations I have made while hiking in some of the more remote areas of our county, where it can be hard to find exotic species that have become established. In most cases, the further one travels away from human civilization, the fewer number and variety of exotic plants are found. There are exceptions to this rule, especially where soil type and/or moisture do not afford these plants adequate resources for growth. Here are a couple of examples of what I have seen in recent years, illustrating to me how new species have potentially moved into our area. On some of the hiking trails, one finds an introduced species growing right along the path, but rarely more than a few feet off the path. 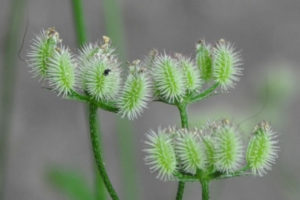 Torilis arvensis, known as hedge parsley, or “sock destroyer”, is a European native having seeds covered with tiny hooks, similar to Velcro. The plant grows within the range of most people’s socks, i.e., 1-2 feet tall. Socks pick up the seeds when the plant is shaken and then transport them to new locations along the side of the trial, thus engineering this unique dispersal pattern. 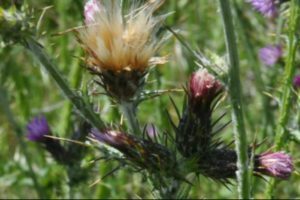 The other example concerns two species; Canadian horseweed, Erigeron canadensis, and Italian thistle, Carduus pycnocephalus. Both of these plants were uncommon in our county 15-20 years ago. Later, they began showing up along roadsides and even later spreading along the trail systems, to the point where they now dominate sizeable portions of our open spaces. Canadian horseweed, although native to North America, has become an “unwanted plant” in many places, common in disturbed areas in full sun, while Italian thistle does best in partial shade, especially under coast live oaks. Both are in the Asteraceae family and produce copious quantities of seeds. Using its pappus, a small parachute connected to one end of the seed, these species achieve phenomenal aerial dispersal potential, even from a single plant. Seeds move with the wind, easily get lodged in vehicles, horses’ hooves, people’s shoes, etc. Thus, these seeds first arrived along roadsides, then moved along the trails into our wildlands. So, I guess the finger of blame for these introductions, and rapid disseminations, points to us, because the patterns of dispersal invariably involve human activity. Next month, I will cite some historical records to further illustrate my point. Carduus and Torilis, right) revealing two different seed dispersion strategies. With the Fall season almost upon us it’s time to start planning on preparation for the Winter season. The most important item on the list is weed control. By applying mulch now you will save lot of labor in the future (next Spring & Summer). Any forest product four (4) inches thick will stop weed growth, but it can also affect desirable plants from thriving if you don’t follow the rules. So start by checking and marking any California native plants, like Baccharis, Lupinus, or Eschscholzia californica, before spreading mulch. Once all desirable plants are plotted using marker flags or sticks, spread a thick layer of clean chips of any forest product four inches thick to suppress weed growth. Leave a one-foot space around desirable plants with no mulch. This will prevent trunk rot. While mulching is not always 100% effective for weed control, it can definitely help mitigate the majority of grass weeds. Happy Gardening; John Nowak, Plant Sale co-Chairperson.